Himeji castle (姫路城) is one of Japan's three most famous castles and is the most visited castle in Japan. It is located in Himeji in Hyõgo Prefecture. It is also known as Shirasagi castle which means "White Heron castle (白鷺城, shirasagi-jo)" because of its brilliant white walls. It is one of the 12 Existed Castles, and National Treasure of Japan. Admission: 600 yen and 200 yen for kids. There is group discount. Open: 9:00 to 17:00 (last entering at 16:00) in winter. Opens until 18:00 in summer. Class:　12 existed Castle, National Treasure of Japan and UNESCO World Heritage. Himeji castle is one of Japan's three most famous castles and is the most visited castle in Japan. It is located in Himeji in Hyõgo Prefecture. It is also known as Shirasagi castle which means "White Heron castle" because of its brilliant white walls. Himeji castle was originally built in 1346 at which time it was called Himeyama castle. In 1331, Akamatsu Sadanori first planned a castle at the base of Mount Himeji, where the heavily fortified temple of Shomyoji stood. However, Akamatsu fell during the Kakitsu War and the Yamana clan took over the building of the castle. Following the Õnin War (1467-1477) the Akamatsu clan once again took over and completed it. It wasn't long until it fell into ruin with the fall of the Akamatsu clan. In 1580, Toyotomi Hideyoshi took control of the ruined castle, and later Kuroda Yoshitaka completed a three-story tenshu. In 1602, following the Sekigahara War, Tokugawa Ieyasu granted Himeji castle to Ikeda Terumasa. Ikeda was responsible for enlarging the castle and over nine years he brought the castle to its current size and design. The current main keep dates from 1601, and the last major addition, the Western Circle, was completed in 1618. Himeji was one of the last holdouts of the tozama Daimyõ or the "outsiders" at the end of the Tokugawa period. In 1868, the new Japanese government sent the Okayama army, under the command of a descendant of Ikeda Terumasa, to shell the castle and drive its occupiers out. 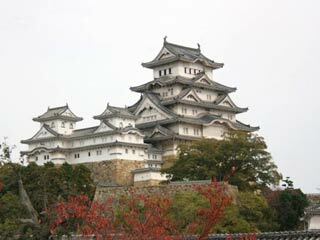 When the feudal system was abolished in 1871, Himeji castle was sold at public auction for 23 Yen (100,000 yen at today's rates). Himeji was bombed twice in 1945, at the end of WW II. Even though nearly all of the surrounding town was burned to the ground, the castle survived almost entirely untouched. One bomb was actually dropped on the top floor of the main keep, but it didn't explode. Himeji castle was registered as the first Japanese National Cultural Treasure by UNESCO World Heritage and a Japanese National Cultural Treasure in 1993. Himeji castle is an excellent example of the typical Japanese castle. It has many of the defensive and architectural features associated with Japanese castles of the period. Himeji's most important defensive feature is the confusing maze of paths leading to the main keep. The gates, baileys, and outer walls of the complex are organised so as to cause an approaching force to travel in a spiral pattern around the castle on their way into the keep, facing many dead ends. This allowed the attackers to be monitored and fired upon from the keep during their entire approach.